Home Desserts Candy Too Good to be True? Chocolate is Good for You! Can a gift of silky, sensuous, melt-in-your-mouth chocolate possibly get any better? How about if it were good for you, AND IT HELPED YOU LOSE WEIGHT? It’s not science fiction; it’s not fantasy—it is a dream-come-true called Chocoperfection. These unbelievably tasty chocolate candy bars were the brainchild of Mary Jo Kringas. Mary Jo started working in her father’s candy store when she was five years old, so it’s easy to understand why she struggled with her weight. Since chocolate was the one food that she could not live without, she did us all a favor and invented a healthful, sugar-free, all natural, chocolate bar and made it the centerpiece of her own successful, low-carb, weight-loss story. This can be your secret weapon for weight loss too. How could you possibly suffer from diet fatigue or deprivation when you can have delicious Chocoperfection bars every day? Chocoperfection comes in three flavors: Milk Chocolate, Dark Chocolate, and Jimmy Moore’s favorite, the new raspberry-flavored Livin’ La Vida Low Carb Bar. The main sweetener in these delectable bars is oligofructose made from chicory root. It is classified as a “prebiotic fiber” because it nourishes the beneficial microbes that live in the intestinal tract. It strengthens the immune system and supports weight loss. It has a glycemic index of zero and will not raise blood sugar levels. Each 1.8-ounce bar has 2 digestible grams of carbohydrate and 14 grams of fiber. Chocoperfection, made by Low Carb Specialties Inc.™, can be purchased online from: www.lowcarbspecialties.com/ or by phone at: 800-332-1773; and from www.carbsmart.com/, www.amazon.com/, www.netrition.com/, www.lo-carbu.com/, and www.low-carb.com/. It is also available in specialty retail stores nationwide. Cocoa beans are not legumes but the seeds of a fruit. (Legumes are seeds that grow in pods that split on two sides.) Chocolate contains copper, magnesium, potassium, and calcium and is rich in beneficial flavonoids like those found in cranberries, blueberries, purple grapes, red wine, and tea. It contains a natural antidepressant similar to Prozac® and has traditionally been used as an aphrodisiac. 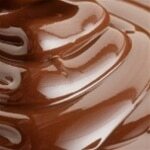 Cocoa butter, the fat found in chocolate, contains a mix of good, natural fats. It is 36% oleic acid, a monounsaturated fat like olive oil, 35% stearic acid, which is converted into oleic acid by the body, and 25% palmitic acid. The remaining 3% is polyunsaturated linoleic acid. A ½ ounce serving of unsweetened chocolate contains 17 mg of caffeine, about the amount in one cup of decaf coffee. (A regular cup of coffee contains about 135 mg.) Chocolate also contains theobromine, which has been used to treat arteriosclerosis and high blood pressure. Studies suggest that theobromine may have anti-cancer effects and help with weight loss. So, eat your chocolate! It’s good for you. ChocoPerection bars, History of chocolate, Prebiotic fiber, Weight loss. Bookmark. I have been blessed all of my human life here on Earth, and for being 42 rounds-around-the-sun, I look very very very young- according to others. As a matter of fact, this very morning a young attractive college girl was flirting with me while my car was being washed. This experience is not rare. One of the main things that has kept me very young- in all sense of the word – is the the daily consumption of green tea and 85% cocoa (super dark chocolate.) Life is fantastic when you become wiser and apply it! Chocolate is considered a super food but and this is a huge but, it should be eaten in it’s raw and pure form. The minute any heat is applied to it it looses it’s value as does all food. Me too I eat a lot of chocolate in it’s pure form. I’m 46, still am the same size I was as a teen and feel great.